Three Seeded Sedge – Carex trisperma. This grass-like perennial fruiting plant that is a native to Canada and a large section of the Northern United States ranging from Minnesota to the New England area. It thrives in a moist environment such as coniferous swamps, bogs, and wet woods and does well in partial shade. It can root in moss. The plant stands tall with stalk less spikes and alternating leaves that grow towards the base. The fruiting season runs from late spring to mid-summer, with the pistillate spikes growing clusters of green seeds. The stalks grow from 1 – 3 feet and provide a natural habitat for woodland animals. Three Seeded Sedge loves wetlands, forests, and swamps. It likes shade and mostly does well there. It is smooth and hairless variety. This perennial herb spreads underground with rhizomes (stems). It can grow as tall as 1 meter. Fruit is present usually from mid-June to late August. It would do well on stream banks, wetlands and lake edges. This plant has a lovely green color. The three seeded sedge has berries that grow on it in the spring. The berries on this grass are edible, but they are very sour and not soft. This kind of native grass is easily adaptable and can grow anywhere that it is planted as long as the soil is wet and moist. This plant has no hairs on the stems of branches. 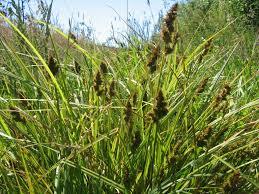 Three Seeded Sedge is classified as a sedge and can often be found growing up to 3 feet tall. It loves to grow in wet shaded areas, around trees, and along river banks. This plant has small flowers which will bloom June to August. It is better to plant in large clumps. The stems change color from light green to a dark brownish color as it gets mature. Growing in climate zones 3 to 9 makes this a very versatile plant. It is a small grower but does well around lakes and ponds.